A muppet inspired jicama slaw. Imagine how hard it must be if you are a unique looking character actor vegetable? Surrounded by all the brightly coloured “pretty” vegetables it must be easy to be ignored. You work hard, you do your job, but no love. For the average cook, the good thing about many of these vegetables is you can get them for cheap. A lot of value for a little money. 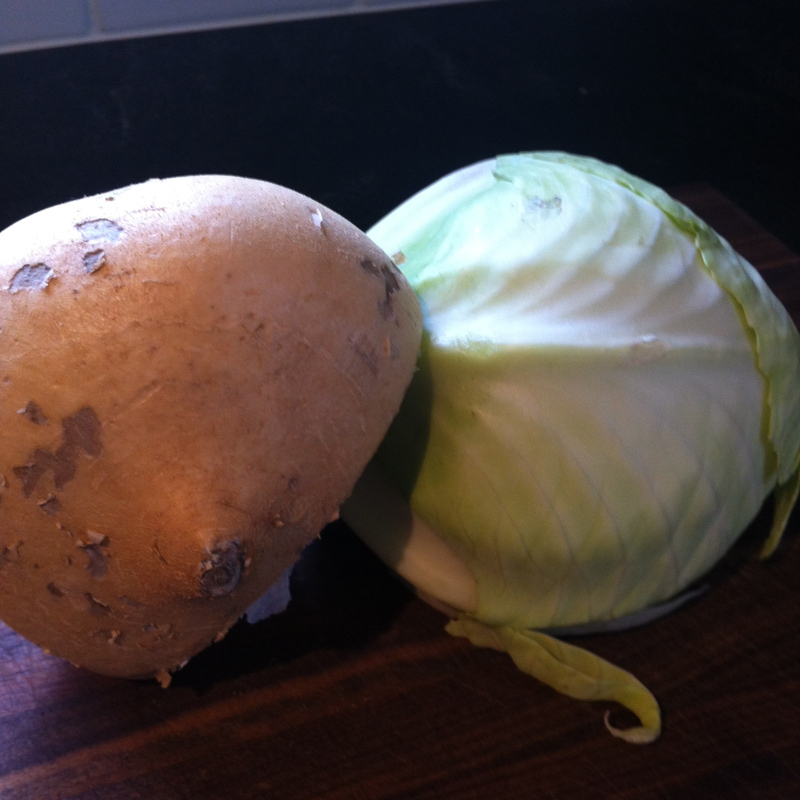 I seem to have taken a bit of a shine to odd vegetables lately. Sunchokes, kale and most recently, jicama. Jicama is a funny vegetable. Sometimes called yam bean root, it’s one of those vegetables that I know I’ve had before, and have certainly read recipes that incorporate it, but it has only been lately that I’ve introduced it to my kitchen on a regular basis. Power couple - Jicama and Cabbage. Jicama is one of those vegetables that if it was on a talk show it would be lauded for being an “overnight success” even though it had been working professionally for decades. It is a starch that is low in calories, and high in fibre, Vitamin C and antioxidants. Despite it’s unattractive (and unedible) exterior it has a crisp and juicy interior (similar to an asian pear or a water chestnut). It is edible raw or cooked with the added bonus that it stays crispy when cooked (which makes it perfect for stir fry recipes!). Whenever I start experimenting with a new ingredient I always try to start simple and healthy. In this case that meant a salad. 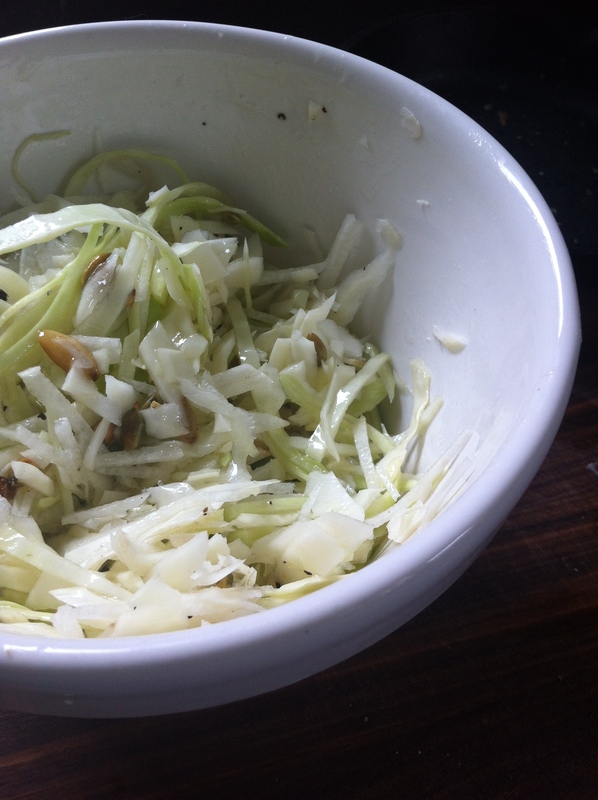 Since I seem to be on a kick for slaw type salads lately first up was a cabbage and jicama slaw. As with all of my recipes it is still a work in progress. 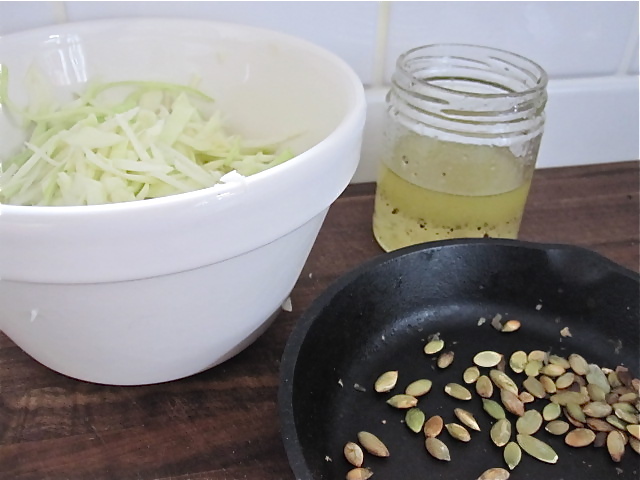 I’ve tried different oils and acids, added various toasted nuts and seeds, and added other grated vegetables (carrots and sprouts). To date I’ve eaten it as an accompaniment with beef, chicken and fish. I’ve also tried it as a main course adding some chickpeas. A hunch tells me it would work well in a sandwich (like a bánh mì) or with ribs or other barbeque type fair, but I haven’t had a chance to try that yet. Although I’m not a big fan, I bet it would also work with tempeh or grilled tofu. This recipe is what has worked it’s way to the top of the pack as the base for all variations. Let me know what you think and if you’re an experienced jicama lover please send me your recipes. While the Academy might not recognize this great vegetable until lifetime achievement awards roll around, it doesn’t mean we can’t! Enjoy! Chop all vegetables and put in bowl. Shake or whisk together all ingredients for vinaigrette. This entry was posted in Cooking, Food, Lunch, Recipe, Salad, Vegetables, Vegetarian and tagged cabbage, jicama, lime, Muppets, olive oil, sea salt, vinaigrette by mostlynoodles. Bookmark the permalink. i like this post! any reference to muppets makes something better for me. i have not had a lot of exposure to jicama, but my interest is piqued. I am a jicama lover! I’ve made all my co-workers try it and it’s a staple in my son’s packed lunches. A quick way to up the taste factor is squeeze a lime over thin slices of jicama and sprinkle with chili powder, my son skips the chili powder, but loves the lime juice. That sounds like a great way to eat it. Very refreshing. Thanks for the suggestion! Love it! Since your first comment I’ve been adding the chili, more lime and some chickpeas and using it as a soft taco filling – Yum! I too am happy to have a jicama recipe to try-I have always wanted to eat it but didn’t know how!! I discovered you and you’re blog recently through wordpress. I discovered jicama about 15 years ago when I lived in Asia, what an unknown gem it is! I love it. I eat it like an apple. Although it’s hard Muppets are great too. How are you? I live in Ireland now. I didn’t use to love food or cooking, but now I do. Now I have to because I live out in the country in N. Ireland with very few inspiring food places. I’ll come back and visit you again. Nice to find you.